– Shakespeare, King Richard III. Dodie Smith, I Capture the Castle, 1949. Black metal and romanticised interpretations of nature have gone hand in glove for the past two decades. One need only examine the reams of cover art which the genre has produced to see a distinct predilection for the mountainous, the forested and more often than not the heavily draped in snow or frost. Much has been written about this and the origins of this association found in black metal’s formative years in the fjords and fells of Norway, some of value, other works sensationalist and cheap, and neither type bear repeating here. Curiously, just across the North Sea in Albion, black metal has for the mainstay failed to truly embody the landscapes which form this most jewelled and sceptered isle. Taking inspiration from the ‘folk-horror’ and Protestant dread that infused the cinema of the 1970s (most notably those which emerged from Hammer Studios with the elegant Christopher Lee and Peter Cushing), doom metal has emerged via the legacy of Black Sabbath to be the genre which, up to now, has most authentically reflected the fields, woods and moors of Britain, albeit in a somewhat staid and at times derivative fashion. There is the feeling in the countryside of something lurking beneath the surface; behind the chocolate box quaintness of hay bales, pasture land and cottages there are the ghosts of gibbets, plague, famine and witch hunts. In discussing this phenomenon the author Robert Macfarlane uses the example of M.R. James’ story The View from the Hill, and describes this lurking eeriness as ‘the skull beneath the skin of the countryside’. This dualistic quality can be found in the beautiful yet anxious and dark recordings of (later) Coil, Cyclobe, XETB, the magnificent and peerless Andrew King and numerous other projects which lurk on the borderlands between the traditional and experimental, and within the filmed works King Penda’s Fen or A Field in England. I grew up with the twin influences of the rural and the doomed, having been raised in Hampshire, schooled primarily in an ancient Medieval institution in the shadow of Winchester Cathedral (Winchester being the original Anglo Saxon capital of the country, with a history steeped in violence, Alfred the Great, saint lore and plague pits) and then enclosed in a boarding school in rural Somerset. In both instances I was surrounded by forests, Medieval remnants, grassy barrows and a lingering sense of the past. It was around this time in which I first became exposed to Black Sabbath, Electric Wizard, The Wounded Kings and similar groups, and there has always been since an association in my mind between the pentatonic dirges inspired by rustic drug abuse and the forbidding hedgerows and coppices of merry England. The rustic, the rural and the wild has always been of deep significance to me, in which the other face of the world can be seen, away from the trivialities and vulgar mass populism found within urban centres. I have briefly moved away from the land of my birth, necessitated by economic considerations (although thankfully soon to return), and I have frequently experience pangs of nostalgia and grief through missing the beauty and ever present presence of the past, a collective Anglo past, in the landscapes of Ing-land. Whilst enjoying my sojourn or exile in the Iberian Peninsula, there are frequently times when I yearn for the softer, more subdued rhythms of the parish, the pudding and the pub. Outside of the realms of metal we find a myriad of genuine folkish outfits which reflect the inner essence of the peculiar English experience, yet within the world of black metal, contenders are rife but none stand up to Ashes, with its haunting beauty, dark grandeur and sense of yearning. As you can see, this review is unusually personal. Taken from Night of the Demon, spoken by Reginald Beckwith. Also used within Coil’s Queens of the Circulating Library. Ashes has long been known to me, since acquiring their second album via Supernal Music in 2007, the sublime and field-recording heavy Hymns to a Grey Sky. Despite being at the time a devotee of all things ‘orthodox’ in terms of black metal (forgive me, we are all young and impressionable at one point), this struck me as a far more honest recording than the myriad of crucifix shattering and shop-bought pig-head-impaling groups that leered out from my (long since purged) record collection. There was something redolent of the Devon dales and the perennially clouded heavens which so often sit over our heads, moist leafed forests and one person’s attempt to put his relationship with the land into music. The following album Yggdrasil continues this richness of tone, and the practise first laid down in Hymns… of interspersing electric components with lilting, mournful acoustic passages which serve to both link songs, and highlight particular melodies throughout the album. The quality of remains high throughout, although of particular note is the closing song “Ashes” which adopts a radically different wall of sound approach, blurring into a dreamy melancholic dirge which actually approaches some tenants of the aforementioned ‘folk-horror’ doom sound. 2009’s Runeworks adopts a stridently harsher tone, in which the complex song structured are almost (but not quite) buried behind the reverb, and Davidian’s voice pierces through the din, emphasising a more combative aspect to both Ashes and the histories which inspire the project, predominantly that of Lindisfarne in Northumberland. Again, the closing song “Runeworks” serves to jilt the album’s style by employing a haunting clean melody, leading the listener out from the ragged primitivism of the previous seven songs into a contemplative clearing. Following an unusual period of transition, which saw Ashes fall into the hands of another musician (resulting in the 2010 EP Forest Psalms) and subsequently be regained by Davidian, the project fell silent. 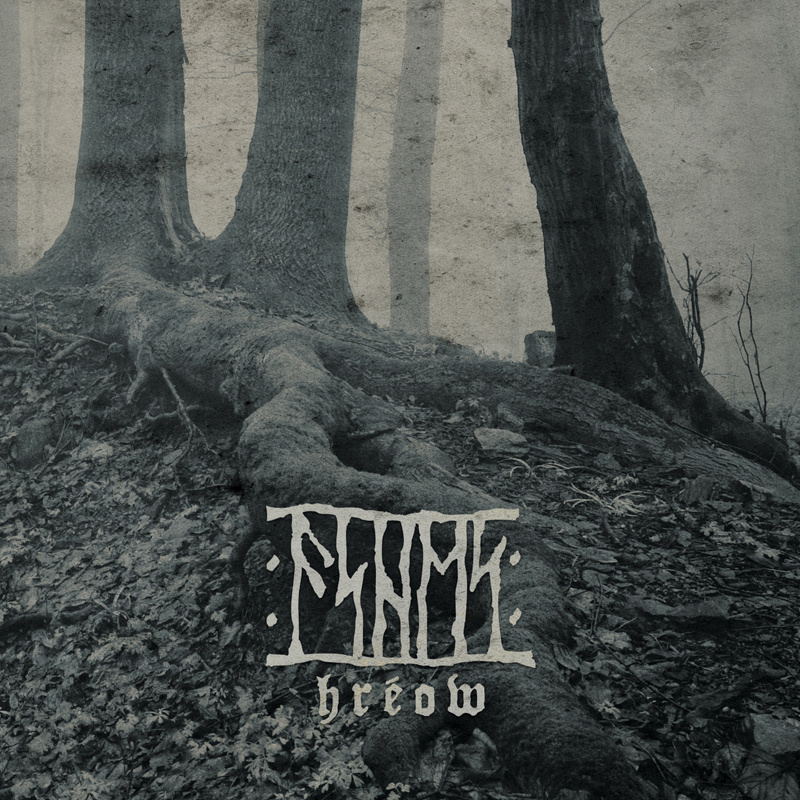 Rumours of a new album were intermittent, and then finally confirmed, however four years passed in Devon before the latest and by all accounts, final, Ashes album emerged, simply titled Hrēow (Old English for ‘Grief’ or ‘Sadness’). It transpires that these four years were very well spent, because this album is not just the culmination of Ashes’ career, but might just be one of the finest and most authentic ‘metal’ albums to emerge from England. Like the Green Man, or ‘Leaf Lord’ (see Hymns…), Hrēow appears to embody the English woodland, its music filtered through root and branch, arriving as a distillation of the ‘hearts of oak’ that forged the early Kingdoms of Wessex, Essex, Kent, Sussex Mercia, East Anglia and Northumbria. Hwær cwom mearg? Hwær cwom mago? Where is the horse gone? Where the rider? Where the giver of treasure? Where are the seats at the feast? Where are the revels in the hall? Alas for the bright cup! Alas for the mailed warrior! Alas for the splendour of the prince! as if it had never been! The Wanderer, lines 92a to 96a. The dating of this poem is contested, with estimates ranging from the late 6th to 10th centuries. Childhood and youth the fields took. Where echoes of joy were all that remained. Scattered in these lines are references to a pastoral, rural and romanticised past before the modern era, complete with a desire to recapture an essentially innocent view and interaction with the landscape, one which in Britain had been stolen from the yeoman by the Industrial Revolution, and the relentless subsequent march of consumer culture. By employing the mechanism of Anglo Saxon poetic aesthetics, Davidian places himself at odds with (and lamenting) both personal circumstances and cataclysmic cultural shift, either in the form of the drastic upheavals brought by the Normans (and their curtailing of the free rights of the Anglo Saxon population), or as a metaphor for the intensive alteration of English culture by the mechanised revolution and the theft of rootedness, of joy and honourable conduct (which our current oligarchic system engages with on a daily basis). There has been an oft overlook phenomenon within England, embodied and coined by George Orwell, of ‘Tory Anarchism’. Whilst seeming oxymoronic (and it is, deliberately), it bears similarities with Tolkien’s ‘Anarcho-Monarchism’ standpoint. Both arrive from a socially conservative point of view which seeks to critique the capital culture and regain a romanticised past, one which celebrates liberty, localism, organic progress, tradition, roots and the heritage of long standing institutions. Both despise the swapping of values for monetary concerns, the mob, the tyranny of modern democracy, dictatorships of the proletariat and vulgar (neo)liberal ideology. This exists to my knowledge solely as an English phenomenon, steeped in a broadminded patriotism which revels in satire, contrariness and fierce individualism. Whilst I would hesitate to ascribe this label to Ashes, there are some similarities that can be determined such as handing over the entire project to another chap to do as he wished with, and I can also see Evelyn Waugh (another ‘T.A.’) agreeing with the sentiments expressed in “The Hills that Cradled”. Like Tolkien, Davidian presents us here with a document of mythology for the English which may have been created to inspire some flickering ember within our souls, although in this case in digital form rather than hefty tomes. As Saruman’s transformation of Isengard from wooded valley into mechanised hell reflected J.R.R’s own lament for the industrialisation and destruction of his native Oxford countryside, so Hrēow represents a rueful hymn to a vanished landscape and hæþen Weltanschauung. It charts not the legion of elves fleeing to the lands of the West, but rather the misery in the disappearance of our complicated but firm sense of national identity which has leeched away in part due to the ‘Decline of Empire’, the reversal of our fortunes and established fear of offence. A celebration of English history has all too often recently been relegated to a despised corner of school textbooks in favour of a modern constructed mea culpa narrative. Dodie Smith, ‘I Capture the Castle’, 1949. One of the most noticeable aspects of this album is the melancholic and romantic nature of the melodies which course through each song. Like the hefty roots which bedeck the cover of Hrēow, each piece is underpinned and grounded by very lovely, melancholic and warm airs that encapsulate the atmosphere of Davidian’s county home. They bring the listener onto the wilds of Dartmoor (with its ancient gnarled woodlands), the heaths of Woodbury Common, the thatched cob cottages that pepper the spaces between rolling fields and rivers, and the turfed cliffs lashed by the sea. Nowhere can this be felt more than within “Heralding the Storm”, where we find near twelve minutes of crackling fires, gorgeous droning tones and a running stream that maintain a continuity of rural utopian feeling, conjuring both the image of being in some wooden Saxon stead or one of Flora Thompson’s sublimely recollected rustic villages. In either case one is cast into the role of looking out from the glowing grate (be it pre-Norman or pre-Edwardian) across into the woodlands, before the Brown Belt developments began to swallow each nook and cranny of a now sadly vanishing England. they hewed battle shields with the remnants of hammers. “The Battle of Brunanburh”, a poem from the Anglo Saxon Chronicle (a document first created in the 9th century during the reign of Alfred the Great, probably in Wessex). Description of the phenomenon of Sehnsucht by C.S Lewis in the afterword to the third edition of The Pilgrim’s Regress, 1933. In summation, this is one of the very best examples of metal from England, whose mature style and county-craftsmanship ensures its status as a yeoman’s gift to his country’s sons and daughters. This is an album which displays its locality through poignant dense atmosphere, skilled lyricism and a unique sense of melody. That Hrēow is only available digitally, and so poorly circulated, is a crime. Put simply, when I find myself in the throes of Sehnsucht away from the oak and hedgerow, I listen to Hrēow, and find myself home again. I doubt that there can be any more precious attribute that an album can possess. To quote John le Mesurier in one of his most endearing roles, ‘…a cottage with a thatched roof, white fence, hollyhocks and roses growing in the garden…you know whenever I pass by there I have to stop and say to myself ‘Well, that’s it I suppose, that’s what we’re fighting for.’ ’ Hrēow does indeed stand as a monument to loss; of that cottage and thousands like it, of identity, nature and sense of place. However, within the final notes we feel within the recited poem a message of hope, pride, and an ember of defiant glory amidst England’s hæþen Ashes. How very fitting. I have not felt the need to mention the likes of Winterfylleth, Wodensthrone, Fen or other more publically visible groups which now are seen as being the luminaries of the English black metal scene inspired by the country’s heritage. All of these groups are highly enjoyable, however Ashes is in my opinion superior to them all in terms of atmosphere, intent and execution, and so I feel it must be discussed on its own merits rather than being viewed as a less visible brother or uncle to them. However, it would be ungracious not to draw the reader’s attention to other, lesser known (or rather, non-stadium) bands whom, regardless of differing agendas and political leanings, all tread the path forged by Ashes in skillfully embodying and exploring the ancient heritages and landscapes of Britain. For this reason alone they deserve greater exposure: Ealdulf (Lincolnshire), Ildra (England, county unknown), Hrafnblóó (Shropshire), Symbel (Midlands), Crom Dubh (London), Forest Grave (Essex), White Medal (Yorkshire), Instinct (Wiltshire) and, in the context of Alba, Saor (Strathclyde). It should also be noted that this review is a personal response to the album, and unlike the following interview does not necessarily reflect either the intent or inspirations which Davidian followed with the creation of Hrēow. This is a doubly auspicious and honoured occasion, being one of only a handful of interviews that Davidian has agreed to partake in and, sadly, the very last he will give on behalf of Ashes, as Davidian has decided to end the project with the release of Hrēow. We here at Black Ivory Tower are grateful and humbled by this acquiescence, and hope that this double feature provides a fitting epitaph to the legacy of Ashes. Personally speaking, I have long been a fan of this project, as the interview will no doubt demonstrate. Davidian has been candid and generous with his time and responses, and we are indebted to him for his efforts. Greetings Davidian, thank you for taking to time to give one final interview before the dusk falls over Ashes. Ashes predates the current interest in ‘English black metal’ (as evidenced by Winterfylleth, Wodensthrone and others) by quite some time, yet remains firmly outside the limelight of these ‘stadium names’. Part of the ‘charm’ of Ashes comes from its solitary nature, and even during the Supernal Music days you chose to engage with minimal publicity, happy for the music to suddenly emerge from Dumnonian realm. Do you feel that this lack of engaging with the promotional circus helps to solidify the otherworldliness of black metal, especially Ashes, or is this merely the by product of a then under-funded genre? It was a conscious decision from the start, yes. I’m not the type of person to magnify any achievement of mine – I was brought up to think that it was simply not done, and it’s stuck with me. Not humble as such, because that implies you know you’re great, but you have manners and play it down – I just genuinely find blowing my own trumpet a bit self-indulgent. Plus, I’m not a very sociable man. I find it tiring and boring. I wanted the music to speak for itself – something separate from the everyday me. Black metal, pre-internet, was this distant, mysterious thing. Really exciting. The only information was from magazines and flyers. Ashes came into play when, believe it or not, the internet was still relatively new in households. The PC I recorded Blackened Wrath on wasn’t even hooked up to the net. Even the Supernal Music site wasn’t online at that point. Imagine that! I was really, really passionate about BM, so naturally I wanted to follow the template that was set down by my influences. I didn’t want anyone to know who I was. I wanted it to be a mystery, plus I hate myself in photos, haha! Something you don’t read about in magazines or see at gigs is the business side. I quickly learned about that. In retrospect, Supernal Music was the best label for Ashes. Alex and I had our disagreements, but at least he was genuinely passionate about his business. Yeah, he got a few things wrong, but as far as I can tell he was running that label on his own. And at its height, Supernal was a reasonable size. He got a bad time for closing the label, and voicing his opinions on illegal downloading, but he was right. He was losing money hand over fist. How much I earned in royalties from Funeral Forest at the start of my Supernal days compared to Yggdrasil at the end was proof in itself. So as Ashes went on, I wanted to be even more distant, anonymous. Because if someone had interviewed me back then, they would have gotten an earful. I was only interested in being creative. How the music industry works is not something that sits well with me, at all. It’s left me very cynical and jaded – and I’ve had a relatively smooth ride. Perhaps I was naïve. Perhaps it’s always been about ‘who you know’. P.R. and networking. That’s not what it should be about. In the long run, my going against the ‘playing the game’ probably stunted Ashes popularity. It certainly didn’t help Hrēow. I sound bitter, but I’m really not. I’d rather I sold 20 albums from word of mouth, than 10,000 by being flavour of the month. I don’t get this whole “We’ve released one E.P. on Bandcamp, and now we have T-shirts on sale. And a professional photoshoot”. Goes against everything black metal in my book. But I guess that’s what it’s come down to now in this digital age. That’s the norm. I’m aware I’m sounding like a grumpy old man. Speaking of grumpy old men (! ), obviously the hoary heads of Forefather leers over the English ‘pagan metal’ label like a huge bearded uncle. However despite embracing themes of heritage Ashes remains refreshingly free from forced chants and hymns to the shieldwall. What would you describe as your primary influences and intentions when starting out with Blackened Wrath in 2003, and how do they compare with the creative process of formulating Hrēow? Christ. 2003. By that point, I was utterly entrenched in the whole ethos of black metal. I’d walk around town in my Darkthrone shirt and bullet belt. As a young teen, it was Metallica, Iron Maiden and Slayer. And then moving on to Paradise Lost, MDB etc. Then I remember a guy came in to class with Cradle of Filth‘s ‘Vempire’. I borrowed it, played it, and suddenly this whole new genre and it’s various off shoots became available. It spoke to me instantly – connected in a way that the clean, overproduced commercial metal had not. It was the emotion that stood out, for starters. And of course, something that would play a massive part in Ashes’ music, the outdoors. What really made me want to do my own stuff was Hecate Enthroned. Their first 3 releases are atmospheric BM at its finest. Forget all the Cradle of Filth comparisons – not that I have anything against them either – but this stuff was real ‘English forests and graveyards shrouded in mist’ type of thing, minus the hammer horror theatrics. And of course, Emperor. That was a real watershed moment. Hearing the opening track and thinking: ‘What the hell is this? !’ Blackened Wrath is basically me blending the above two bands, and trying to find my own style, as you do when creating your own music. I wrote what I enjoyed. That’s all you can do. You come up with a riff that you would pay money to hear, essentially. That was how it started. As you grow, your tastes change, and if you’re truly making music for yourself, you write what you want, and if the audience go with it, then great. We’re obviously on the same page. But if not, I don’t really care. An album is a snapshot of that person or group at one particular time. When it came to writing Hrēow I just followed the same plan as all the other albums. Do what comes naturally at that time. The moment you write to please someone else, stop. Expanding beyond the ‘English forests and graveyards’ aesthetic of Hecate Enthroned, Ashes explores predominantly themes of English pre-Christian culture, myth and landscape. Whilst the education system in the UK is falling pretty severely, even the most rudimentary student of history would detect a strong favouring for the Early Medieval (i.e. Anglo Saxon) period in your writing from songs such as ‘Danelaw’, ‘793’, ‘Runewheel’, ‘Lost Gods’ and others. Devon lies in the ancient Brythonic kingdom of Dumnonia, which became subsumed by the Anglo Saxon kingdom of Wessex, and as such the layers of history lie thickly across its landscapes. How deeply do you feel influenced by these layers, their vestiges of history in ruins, menhirs, burial mounds and folklore, and the natural beauty of Devon? Ashes is basically a love letter to Devon. I’ve grown up here, explored pretty much all of it. In England, I wouldn’t live anywhere else. I like the fact you’re only ever half an hour away from something, be it the moor, stunning countryside or the various beaches. There are so many stories and legends, it would fill 10 albums or more. I live near Woodbury Common, which is this amazing, huge piece of heathland. You’ve got Woodbury Castle on there too. Oh, and recently Clinton Devon estates introduced wild ponies on the common. They were imported from somewhere nearby that has taken the land for building houses. I see them in the morning. They look pretty happy. So, yes Devon is my muse, so to speak. Stuck on a bit of music, can’t get it to work? Go outside for a walk. The idea of Ashes as an elegy to Devon is an unexpectedly beautiful one, and leads me to ask the origins of one particular Ashes track which remains one of favourites. Contrary to much of the album, the final song on the Yggdrasil album , “Ashes”, is unusual, being more akin to a heavy droned-out shoegaze than anything else. It acts as a logical extension to some moments in Hymns to a Grey Sky and the compilation track “Fimbulvetr”, however what prompted this rather lovely, sad and lonely track to close an album of mid-paced black metal, and for it to be so eponymously titled? I was nearing the end of recording Yggdrasil, and – now I don’t want to sound like a BM cliché – I was re-reading The Hobbit. The passage that describes the Stone Giants throwing rocks at each other in the thunderstorm really stood out that time round. It’s so well written and atmospheric. It made me want to write something. Something that reflected the heaviness of them, the chaos they were causing, leaving crushed forests in their wake. I imagined travellers nearby, running from campsites in terror, leaving behind the ashes of fires, hence the name. It just seemed the right thing to call it. The guitars on that track are down tuned, and there are a lot of layers compared to a normal Ashes track, hence the ‘big’ feel of it. I was happy with the finished product, so I stuck it on the end of Yggdrasil. Interestingly, no-one has ever picked up on the fact that the closing acoustic section on “Snow” is the main riff from “The Shield-Wall” by Forefather. I thought it was obvious. Clearly I did such a bad interpretation, no one recognised it. Personally speaking I did not recognise this at the end of “Snow”, however this may be because I prefer your interpretation to the original! On the subject of ‘interpretations’, in 2010 you made the unusual decision to hand over Ashes as a complete package over to another musician, Abrecan, who made the Forest Psalms EP. Whilst this was good in its own right, I felt it did not live up to the depth and complexity which characterised your own releases with Ashes. What prompted you to take back control over the project, the lengthy gestation of Hrēow, and how did its creation unfold over the four years since Forest Psalms was released; was it a result of ‘unfinished business’ artistically, or does it hint at a future direction for your musical output post-Ashes? I’ve had a love hate relationship with Ashes. At that point in time I just wanted shot of it. I’d left Supernal, Runeworks came and went. I felt I’d done what I could with it. But I didn’t want to ‘finish’ it. I wanted to leave the door open. Any normal person would have just put a band on hiatus. The guy, Anthony, who I knew, was up for it. He’d been playing in a few local groups, and knew about Ashes only from what I had told him. I had this odd idea, and he just went with it. I like the EP. It’s very Burzum-ish. Dreadful production, though. He did on a little handheld digital recorder. I took it back because I had the itch to write again. I wanted to make something in the style of Yggdrasil, sort of like a part II. Regarding Ashes, it was clear Tony had lost interest, and he had other things on the go, so it wasn’t a big deal. It was pure fluke timing that shortly afterwards I got the Candlelight deal. Hrēow started slowly. When you’re doing it yourself, and you have a full time job and family, you can go weeks without writing. I would do a bit here and there. Bits were scrapped and started again. It was a very start/stop process. I only dropped one song off the album – “Shields of Faith”, it was called. I just couldn’t get it to flow right, so it went. The album was actually completed mid 2013. But due to a multitude of problems, and a lack of interest from the label, it was held up for a while. The guy I directly dealt with at Candlelight was amazing. If you’re reading this and you enjoyed the album, you have him to thank. I get the feeling he really fought for it. Regarding Candlelight, at the moment Hrēow is available only in digital format. Is this Ashes aligning itself with the internet age, or are there other considerations for making this masterpiece a ‘download only’ release? This was something Candlelight decided on. I’m very proud of the album, and think it stands head and shoulders above previous releases. I was under the impression it would be made available physically… I don’t think the label and I were on the same page. The powers that be didn’t see as a marketable entity, obviously. But, it is what it is. At least it’s out there. I’m thankful for that. Hrēow seems to be a poignant album to end the project on. To my ears there seems to be a genuine lament within the album for the current age of England – the lyrics of “The Hills that Cradled” have a particularly romantic and melancholic nostalgia for a pre-industrial environment – and the album as a whole charts the disappearance of innocent nature-centric view of the world, a sadness for the tearing of roots between the English people and their lands through intensive urbanisation and cultural assimilation. What ‘grief’ is in fact being referred to throughout Hrēow; is it specifically reflecting a current situation or does it refer to a more general feeling of dissatisfaction with your surroundings? Well, if it sounds like a sad album, that’s because it is. I wrote it when my marriage was ending. I left the family home, and I faced a very black period in my life. It was written in a grotty bedsit in the evenings after work. Weekends I would go out walking. That’s where the majority of the inspiration came from. In the countryside, the moors… I’d go back to that horrible room and write. It was bleak. It was a very sad time. Yes, the lyrics deal with the slow death of England of old. We all know what’s happening, we all read the news. I’m not going in to that here. But look a little closer at the lyrics, you can see it’s autobiographical, too. As I’ve said previously, an album is a snapshot of that particular time. As a ‘snapshot in time’, each Ashes album has a particular ambience which I feel is key to the Ashes experience. Yet Ashes thankfully avoids falling into the crowds of copy cat ‘atmospheric black metal’ bands which are now ten a penny. Instead there is an intangible ‘Englishness’ to the Ashes sound(s), which to my mind bring the visions of rains, beech woodlands, burial mounds, moorlands and firesides (especially in the gorgeous ambient piece “Heralding the Storm”). This reflection of regionalism and an intangible aural quality which reflects that area has a longer history in France (see Peste Noire, Autarcie, Sale Freux and others), but is only recently enjoying a surge in artistry in England. This echoing of history and identity is inevitable to any black metal artist who harbours a personal relationship with his native surroundings, but why do you feel that only in the past few years have we seen more groups beginning to embrace this newly coined ‘English Heritage Black Metal™’ thematic approach? It’s a term coined by lazy journalists, isn’t it? Magazines can’t seem to function if they can’t stick a band into a pigeon hole. In all honesty, I don’t really follow the scene anymore. I’d imagine that if you’re English, you have a forest on the front cover and have song titles about historical events you automatically get lumped with that title. I wonder how many of these bands are actually putting a genuine English spin on their music, and approaching song writing in a truly sincere and unique way, trying to enlighten the listener, and how many are just copying the template laid down by larger bands, just because it’s the done thing? Hahaha, how many of these bands own a pair of hiking boots and smoke a pipe? But, seriously I’m all for it. As we become further disconnected from our history and the backgrounds that made us what we are, I think it’s vital we keep that flame of memory alive. Through all mediums, not just a genre of extreme metal. Festivals, poetry, painting… anything that celebrates it should be encouraged, not frowned upon. Ashes worked because you can’t fake that connection. The surroundings and the rich history I get so much pleasure from, it’s rooted deep in me. An appreciation like that is something you can’t copy or put on. Roots, old worn boots and pipe smoking…this leads me to mention that with some delight I have read in a rare previous interview that you find a special affinity for the Green Man (or ‘Jack in the Green’), a legendary figure within English folklore and symbol of all that is wild within the Greenwood. Without wishing to get too Jethro Tullish about things (i.e. Songs from the Wood) what about this figure is it that you find so interesting? Do you feel that as a symbol he embodies the English countryside, and how on earth does his presence survive there? I like how he survived Christianity. He was one of the few figures that was brought over to the new faith, in order to not alienate the pagan converts. Even though he’s found throughout Europe, there’s something quintessentially English about him. He IS the countryside. And very much alive in Devon, I might add. Can’t speak for the cities. As we speak the May pole is coming out in the village where I live. The primary school have made an effigy to him. It’s great to see – the little 5 year olds know who he is… I guess there’s no need for him in Birmingham, is there? He survives where he’s needed. Despite the ‘Leaf Lord’ being present in the nooks and crannies of rural England, there can be no doubt that the spirits of England and Britain are living through strange times. There seems to have developed a deep lack of connection between the people and the land, to the point where many urban children are horrified at the origin point of an egg, or unable to identify a sheep from a cow. Merely identifying as ‘English’ can land one in hot water with some people, which makes anyone creating specifically localised music both reactionary and revolutionary. Even the darlings of the metal press Winterfylleth have had their share of troubles, and an entity such as Wodfreca Records has folded due to a lack of interest even among its own artists! Why do you feel there is both a lack of affinity for the rural in the youth, and a lack of connection with history/ancestry; is it imposed from above (thank you New Labour/Con-Dem) or is there some inner(city) sickness which is creating a radical departure from identifying with the non-urban/non-multicultural landscape? Politics is the root cause. So many issues, making a perfect storm. I think a lot of it has to do with the majority of people being priced out of the countryside, for one. People are crammed into cities, sky high. Fastfood. Internet. I could go on. Everything is geared to small attention spans, with zero effort or activity involved. Then the schools aren’t doing enough. I can’t imagine that in history lessons they are teaching a class full of immigrants the crucial events that shaped this country, the roots… Do they have field trips anymore? Do inner city schools celebrate May day? Get the pole out? Not encouraging them to go out on farms or woodlands, feel the moist soil and moss under foot. Over the past twenty years, we’ve slowly being drip fed through the media that to be… not proud… that’s overused and a cliché now… but to be happy with and accepting of our rich heritage and traditions that are centuries old, that essentially shaped the country into what makes it such a longed after and popular place it is today, somehow makes us social outcasts. That we are the ones not fitting in. I don’t claim to understand why it happened, or why it still continues. It’s troubling. I guess it’s good, and morally right to be welcoming, open minded and tolerant of people who settle here, seeking refuge and solace from war torn countries, just wanting somewhere safe, or just moving here for a better life for them and their family. I get that. We all want that… but to do it to such an extent that the indigenous population feel as though they are restricted as to what they can and can’t celebrate, or voice an opinion, regardless of their class or education… well, as I say. Troubling. With Hrēow, Ashes retreats forever back into the woodland. Having maintained a dedicated core of followers for several years, despite the lack of promotion through Supernal and Candlelight, what if anything would you like to say to them, and what would you wish the legacy of Ashes to be? I’m flattered. It’s nice to know that my creative endeavours weren’t met with total derision. To be honest I got way more hate (e)mail than praise, so I’m not totally convinced that I had that many followers! And if I did, they certainly weren’t fans. But people keep saying I had an impact… So, thank you. It means a lot. As for legacy? I think I’ve polluted the underground with enough under produced BM to last a lifetime. Do something else, kids! Now stop staring at this screen and get outside. Thus Ashes passes into the annals and chronicles of history. An authentic monument to Devon and, more broadly, England. An elegy to a vanishing past, and landscapes whose genius loci still linger, if one knows where to look. My gratitude to Davidian for his time with this interview, and his works over the years. Photos courtesy of Seiðstafr Photography. Molotov cocktail in the face of music whorenalism.